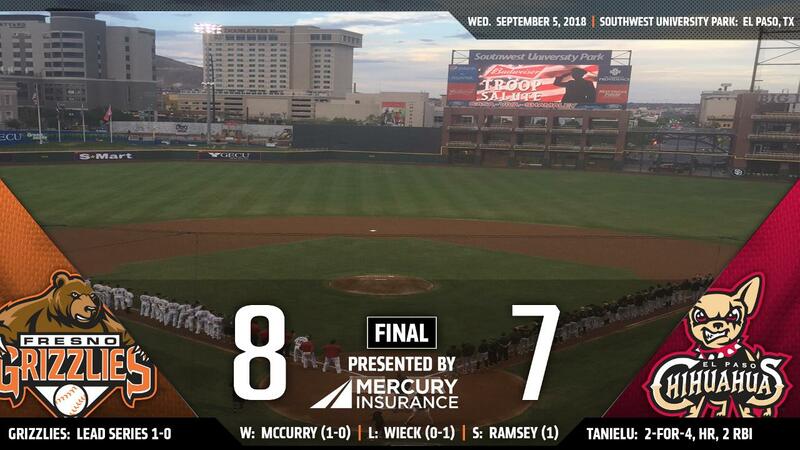 The Fresno Grizzlies (1-0) survived the El Paso Chihuahuas (0-1) 8-7 in 10 innings in game one of the PCL Pacific Championship Wednesday night from Southwest University Park. Fresno improved to 6-6 in extra frames and 26-11 in 2018 set openers. Brendan McCurry (1-0) enjoyed the victory after one and one-third innings of shutout ball. Brad Wieck (0-1) suffered the decision despite whiffing two in one-plus frames. Fresno jumped out to a 4-0 advantage in the top of the first. After a pair of free passes and a hit-by-pitch loaded the bases, Yordan Alvarez scorched a two-run double to left. Both Kyle Tucker and Jack Mayfield came around to score. Then, an error and fielder's choice plated two more for the Grizzlies. In the bottom of the second, El Paso cut the deficit to 4-3. Allen Craig crushed a pitch to dead center. The solo shot was his first of the postseason. Three batters later, Dusty Coleman connected on a pitch and powered it over the left-center wall. His first homer of the series knocked in a pair. An eight-hitter bottom of the third put the Chihuahuas up 5-4. Ty France (2-for-4) spanked a single to center, adding Forrestt Allday. Then, Brett Nicholas (2-for-4) stroked a single to right, knocking in France. Tucker evened the contest at five in the top of the fifth when he sprinted home on a wild pitch. Later, Nick Tanielu (2-for-4) made it 7-5 Fresno when he rocketed a two-run clout to left field. It was his first of the playoffs. That would end the evening for El Paso righty Walker Lockett. He was charged with seven runs (five earned) on four hits, five walks and three strikeouts in four and two-thirds frames. On the other side, Brady Rodgers departed after four innings. He scattered six hits, five runs (earned), while walking three and punching out four. Ralph Garza followed Rodgers and flung two scoreless frames, whiffing one. Riley Ferrell mustered one and two-thirds innings of shutout relief, too. A two-run bottom of the seventh by the Chihuahuas knotted the score at seven. Raffy Lopez (2-for-5) found green grass to right, notching Shane Peterson. Then, a sacrifice fly to deep center by Coleman allowed Craig to waltz home. Myles Straw provided the Grizzlies with an 8-7 lead in the top of the tenth. He roped a single to right, inching Alex De Goti home. With the one-run advantage, Matt Ramsey fanned Nicholas with two runners on to end the ballgame. He secured his first save in the process. Garrett Stubbs recorded two hits and a walk in the win. Both teams combined for 15 walks, four hit batters and 17 punchouts. Both squads continue the PCL Pacific Championship series with game two Thursday evening from Southwest University Park. First pitch is scheduled for 6:05 PT. Fresno RHP Trent Thornton (0-0, 0.00) and El Paso LHP Logan Allen (0-0, 0.00) are the probable matchup.